My boss encouraged me to participate in this. I have been educating myself lately with global warming so I am making a decision to participate in Earth Hour 2008. 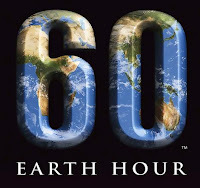 Earth Hour will take place throughout the Philippines from 8 to 9 pm on Sat, 29 Mar. 2008. WWF invites you to participate by shutting off lights for 60 minutes, organizing your own "lights-out" event or by forwarding this mail to your friends, workmates and family. YOUR participation will go a long way in spreading the message that we, as individual droplets working collectively – can create an impetus far more powwerful than the mightiest of rivers. If you want to learn more about how else you can help make Earth Hour in the Philippines a success, drop us a line at (632) 920-7931, (632) 920-7923, or (632)920-7926. If you are curious about this and need to know more, please go to Earth Hour's website.